At that time, Universal Worthy Bodhisattva further addressed the great assembly saying, “Disciples of the Buddha, going back to the remote past, passing through kalpas as many as fine motes of dust in world systems, and further doubling that number, there was a sea of world systems called ‘Light of Purity of the Universal Door.’ Within that sea of world systems was a world named ‘Supreme Sound,’ which was supported by a sea of nets of mani flowers. It had worlds as many as fine motes of dust in Mount Sumeru as its retinue. Vairochana, the title of this chapter, refers to the clear, pure Dharma-body Buddha who pervades all places. “To pervade all places” means not to be located anywhere and yet to be omni-present. It is a clearness and purity which extends to the ends of empty space and the Dharma Realm. This, the sixth chapter in the eleventh roll of the Avatamsaka Sutra, discusses the causes and conditions of Vairochana Buddha. And so you see, our Saha World system is not the only existing world system. Beyond our Saha World are yet many more world systems, as many as fine motes of dust, far more than anyone could ever count. Being here in this world we aren’t aware that those other worlds exist; we suppose our world is the only one. “Disciples of the Buddha, within that world Supreme Sound was a sea of fragrant waters, called ‘Pure Light,’ and from within that sea an immense mount sumeru shaped liked a lotus flower arose, called ‘Banner of Universal Adornments of Blazing Flowers,’ encompassed by ten jewelled railings. “It took the shape of a perfect circle. At that time, which was kalpas ago as many as fine motes of dust, there was a sea of worlds called, ‘Light of Purity of the Universal Door,’ and in that sea of world systems was the world called ‘Supreme Sound.” A perfectly symmetrical globe, Its earth was essentially composed throughout of limitless adornments, and it had a myriad jeweled trees, three hundred rows deep, together with a ring of mountains, which entirely encircled it. “Clothing, food, and drink arrived according to one’s thoughts.” Immediately following upon a thought for a particular style of dress, that style of clothing appears. That’s not how it is in this world, where we either must make our clothes ourselves or go out and buy them. In that world one need only think about whatever kind of fine clothing one wants to wear and it will appear. And if one has an appetite for a particular kind of food or drink, one doesn’t have to go to the kitchen to prepare it or go out to buy it, all one has to do is think about something to eat, and it will appear directly following upon one’s thought. This is because the living beings of that world have the reward of blessings, and so things are very convenient for them. “Its kalpa was named ‘variously adorned,’ because it was adorned with many different kinds of precious objects. “Disciples of the Buddha, within that world Supreme Sound was a sea of fragrant waters, called ‘Pure Light,’ and from within that sea an immense mount sumeru shaped like a lotus flower arose, called ‘Banner of universal adornments of Blazing Flowers.” That huge lotus flower was itself composed of flowers, each of which emitted spectacular lights, and it was encompassed by ten jeweled railings. Those railings were made up of all the various kinds of jewels: gold, silver, lapis lazuli, crystal, mother-of-pearl, red pearls, and carnelian, and they surrounded the mountain on all four sides. “On top of that mountain was a great forest called ‘Wheels of Blossoming Mani Branches.’ Innumerable floral pavilions and jeweled parapets entwined it in order. There were numberless banners, wonderfully fragrant, and jeweled mountain banners, most sublime and magnificent. There were numberless jeweled pundarika flowers blooming profusely. Numberless nets of fragrant mani lotus flowers surrounded it and trailed down. There was the sound of harmonious music and there were boundless fragrant clouds shimmering with brilliant light. Millions of kotis of nayutas of cities completely surrounded it, and the living beings inhabiting them were of many different kinds. “On top of that mountain was a great forest, which was called ‘wheels of blossoming mani branches.” Within that forest there were innumerable floral pavilions and jeweled parapets which entwined it in order. That circled it on all four sides in orderly fashion. There were numberless banners, wonderfully frgrant, as well, and numberless jeweled mountain banners, most sublime and magnificent. There were numberless jeweled pundarika—white lotus—flowers blooming profusely, which were extremely pleasing to look at. Numberless nets of fragrant mani lotus flowers, more than one could possibly count, surrounded it and trailed down. There was the sound of refined and harmonious music pervading all places, and there were boundless fragrant clouds shimmering with brilliant light, which shone upon that world keeping it perpetually bright—one could never span their extent. “Millions of kotis of nayutas of cities completely surrounded it on all four sides, and the living beings inhabiting them were of many different kinds. “Disciples of the Buddha, east of that forest was a great metropolis, called ‘Blazing Light.’ It was governed by a human king. Millions of kotis of nayutas of cities completely surrounded it. The inner city, which extended seven thousand yojanas, vertically and seven thousand yojanas horizontally, was composed of pure and wonderful jewels. Its outer walls were composed of the seven precious stones. Its towers and parapets, for repelling enemies, were all lofty and beautiful. The city moat, inlaid with the seven jewels, was filled to its brim with fragrant waters. Universal Worthy Bodhisattva again addresses all the Bodhisattvas, “Disciples of the Buddha, East of that forest was a great metropolis.” On the side of Mount Sumeru there was a vast forest. That forest contained limitlessly many floral pavilions. To the east of that forest, called “Wheels of Blossoming Mani Branches,” there was a big city, “called ‘Blazing Light.’ It was governed by a human king, a wheel-turning king among people. There are four kinds of wheel-turning kings: gold wheel-turning kings, silver wheel-turning kings, copper wheel-turning kings, and iron wheel-turning kings. A gold wheel-turning king governs as entire world system, which includes all of the four great continents. A silver wheel-turning king governs three great continents; a copper wheel-turning king governs two, and an iron wheel-turning king governs one great continent. “Millions of kotis of nayutas of cities completely surrounded it. There were so many other cities fully encircling the City of Blazing Light that one could never discern their exact number. And, The inner city, which extended seven thousand yojanas vertically and seven thousand yojanas horizontally, was composed of pure and wonderful jewels. This city was entirely constructed of very precious, rare, and valuable gems. Viewed at vertically, that city rose seven thousand yojanas in height, and observed horizontally, it’s expanse was seen to be seven thousand hojanas across. A yojana is a unit of measure. There are small, middle-sized, and large yojanas. The ones being discussed here were no doubt large yojana. One small yojana is equal to twelve miles, a middle-sized yojana is equal to twenty miles, and a large yojana to twenty-four miles. Since the seven thousand yojanas referred to here are certainly big ones, you can imagine how large that city must have been! “Its outer walls were composed of the seven precious stones. There was the inner city and its outer cities, or suburbs, all of which were constructed of the seven precious things. Its towers and parapets, for repelling enemies, were all lofty and beautiful. On top of the city walls were turrets and parapets, military guardhouses where the sentries kept watch to prevent enemy invasions, and those were all very high and imposing. “Utpala flowers, padma flowers, kumuda flowers, and pundarika flowers, wrought from a multitude of gems, were spread out everywhere as ornaments, and seven rings of precious tala trees encompassed it. The palaces and towers were adorned with many jewels; a variety of wonderful nets were draped over them. Rubbing incense and fragrant, lustrous flowers were scattered throughout. “There was utpala flowers, which are blue lotuses, padma flowers, or red lotuses, kumuda flowers, an edible variety of white lotus, and pundarika flowers, another variety of white lotus, wrought from a multitude of gems. They were spread out everywhere as ornaments. All those precious lotus flowers were scattered about, and seven rings of precious tala trees encompassed it.” Tara is a Sanskrit word which is translated as “shoreline’ tree, because these trees grow on the banks of rivers. They are also great, tall trees which grow to be somewhere in the area of seventy feet high. These trees stood in seven rings surrounding the moat where the lotus flowers grew. “The palaces and towers were very tall and adorned with many gems. A variety of wonderful nets were draped over the tops of them, rubbing incense and fragant, lustrous flowers were scattered throughout.” Rubbing incense is a kind of sachet incense which is applied to the body for the purpose of hygiene. A small amount is applied to the hands to cleanse them, as a gesture of respect for the Buddha. Having clean hands is one way of showing respect for the Buddha. This was originally an Indian custom. In the Eighty-eight Buddhas Repentance Ceremony there is a phrase, “Mwo syang tu syang, syau syang.” “Mwo suang” is a powder for burning, and the “tu syang” is a paste incense which is applied to the body. According to the Indian custom, anyone who wanted to participate in a Buddhist ceremony would first wash his hands and then rub some paste incense on them. That’s how it came to be a Buddhist practice. This custom is no longer widely practiced in India, but it was brought to Japan, where there are still some laypeople--particularly those who study the Secret School—who practice it. “There were millions of kotis of nayutas of entrance ways entirely embellished with jewels. In front of each one of those gates hung forty-nine precious shila banners in orderly array. “Moreover, there were millions of kotis of parks and groves encircling it all around, within which were various kinds of blended incense mani trees whose fragrance were pervasive, a multitude of birds sang in harmony, delighting those who heard them. In this city, Blazing Light, “There were millions of kotis of nayutas of entrance ways entirely embellished with jewels. In front of each one of those gates hung forty-nine precious shila banners in orderly array.” Those forty-nine Precious Shila Banners were “auspicious” banners, or “clear and cool” banners, since “shila” is Sanskrit for both “auspicious” and “clear and cool.” Each banner was set beside the next in a very orderly arrangement of rows and crossrows, like a net, and none of the rows were the least bit askew. “Moreover, there were millions of kotis of parks and groves encircling the city of Blazing Light all around, within which were various kinds of blended incense mani trees, whose fragrances were pervasive. The fragrances from the mani trees permeated the atmosphere, drifting in a continuous stream all about the forest, and then sailing on to all the outlying areas surrounding the great city. “A multitude of birds sang in harmony, delighting those who heard them.” All the various kinds of songbirds were there blending their voice together—this one chirping his tune, and that one warbling his. Those who heard the birds’ melodies became quite blissful. “Of those people who dwelled in that great city, none had not accomplished the karmic reward of the complete spirit. They ascended space in their coming and going, and their activities were identical to those of the gods. Whatever they wished for appeared in response to their thoughts. “Of those people who dwelled there in that great city, Blazing Light, there were none who had accomplished the karmic reward of the complete spirit. The result of their collective past karma was to receive the reward of the Penetration of the Complete Spirit—every one of them had accomplished it. They ascended space in their coming and going. They were able to travel through the air without using an airplane; they could float in space. They could go anywhere they wished for a vacation and could return when every they wanted, and they didn’t have to buy an airplane ticket. And so, those of you who enjoy traveling should quickly develop your spiritual penetrations so that you, too, can be reborn in such a great city and receive the karmic reward of the complete spirit. Then you’ll be able to rise in space and come and go as you please. “To the south of that metropolis Blazing Light was a deva city, a city inhabited by gods. And that city was called ‘tree adorned with flowers.’ To the right of that city was a big city of dragons, called ‘ultimate,’ where the dragons lived, and next to that was a city of yakshas, called ‘Banner of Supremely Wonderful vajra.’” Here the test has been discussing the cities where the gods, dragons, and others of the eight-fold division lived, starting with the gods, then the dragons, and now the yakshas. Yakshas have an extremely ugly appearance. There are yakshas who travel on the surface of the earth and those who travel through space. Yakshas are also known as ‘speedy ghosts,” because they move very swiftly. They lived in Banner of Supremely Wonderful Vajra City. “Next in succession was a city of Gandharvas, called ‘Marvelous Palace.’ Gandharvas are the music spirits of the God Shakra, Chief among gods. Gandharvas are also called ‘incense sniffers,’ because when Shakra wishes to hear them play music, he burns a special kind of incense, and its fragrance draws them to the spot. Then they all come and dance and entertain Shakra with their music. “And next to that was a city of asuras, where the asuras—‘ those of non-upright appearance,’ and ‘non-gods’—lived. It was called ‘Jeweled wheel’ City. “Next in order was a city of garudas, called ‘Wonderful Jeweled Adornments,’ and next to that was a city of kinnaras called ‘Rambling in Playful Sport.’ Next was a city of mahoragas, called ‘Vajra Curtain’, and next to that was a city of Brahma heaven kings, called ‘Various Wonderful Adornments.’ And there were others such as those, millions of kotis of nayutas in all. Each one of those cities had millions of kotis of nayutas of pavilions completely encircling it, all limitlessly adorned. “And there were others such as those cities just mentioned above, millions of kotis of nayutas in all. Each one of those cities had millions of kotis of nayutas of pavilions completely encircling it, all limitlessly adorned. All those cities, and all the pavilions encircling those cities, were graced with boundless, limitlessly many extraordinary and exquisite adornments. “Disciples of the Buddha, within the forest Wheels of Blossoming Mani Branches, there was a Way-place called ‘Jeweled Flowers Universally Illuminating.’ It was bedecked with an array of magnificent jewels and a profusion of wreaths of mani flowers in full bloom. The fragrant oils used to burn in its lamps glowed with a complete spectrum of jeweled colors, forming resplendent, blazing clouds and nets of universally illuminating light. From its full array of ornaments there continually welled forth exquisite gems. The strains of its music were consistently elegant and refined. From regal mani jewels emerged images of Bodhisattvas. An assortment of wondrous flowers were scattered everywhere throughout the ten directions. Universal Worthy Bodhisattva is about to expound the next section of text, and so he calls out, “Disciples of the Buddha, within the forest wheels of blossoming mani branches, that great, adorned forest, there was a way-place, a Bodhimanda where the Dharma was spoken, called ‘jeweled flowers universally illuminating,’ because it was graced with an assortment of precious flowers which emitted light that illumined the ten directions. That Way-place was bedecked with an array of magnificent flowers and jewels and a profusion of wreaths fashioned from all sorts of precious mani flowers in full bloom. The fragrant oils which were used to burn in its lamps glowed with a complete spectrum of jeweled colors. Each variety of fragrant oil, when burned, gave off a different hue of light, forming resplendent, blazing clouds. The sky above that way-place was filled with billowing, spectacular, radiant clouds, and there were also various nets of universally illuminating light. From its full array of ornaments there continually welled forth exquisite gems. A variety of extraordinary jewel constantly bubbled forth from within those ornaments. The strains of its music were consistently elegant and refined and harmonious. “In front of that way-place was a great sea, called ‘Fragrant Mani Vajra.’ From it emerged a huge lotus flower called ‘Flaming wheels of flower buds.’ Its blossom was vast and magnificent, hundreds of kotis of yojanas in size. Its stem, leaves, filaments and calyx were all of wondrous jewels. Ten clusters of ineffable, hundreds of thousands of kotis of nayutas of lotus flowers encircled it. It perpetually emitted light and wondrous sounds which universally pervaded the ten directions. That great lotus, called Flaming Wheels of Flower Buds, perpetually emitted a great light and, not only that, it spoke the Dharma and continually emitted wondrous sounds, as well. From within that light there came forth subtle and wonderful sounds,which proclaimed all Dharmas and universally pervaded the ten directions.” Both the light and the sounds of Dharma universally pervaded the ten directions, continuously without interruption, to the exhaustion of empty space and the Dharma Realm. “Disciples of the Buddha, you should know that one hundred years before that Buddha was about to appear in the world, the forest Wheels of Blossoming Mani Branches was everywhere adorned and purified. Universal Worthy Bodhisattva again calls out, “All of you Disciples of the Buddha, during the very first kalpa of that world called Supreme Sound, Thus Come Ones as many as the fine motes of dust in ten mount sumerus appeared in the world. The very first kalpa, of course, begins the cycle of coming into being, stasis, decay, and emptiness. Those four terms are explained as follows. A thousand small kalpas together make up a middle-sized kalpa. One middle-sized kalpa covers a period of coming into being. A period of stasis also spans twenty small kalpas, a period of decay is twenty small kalpas long, and a period of emptiness is also twenty small kalpas. “But,” you say, “I can’t possibly conceive of that long a period of time. “Well, if you can’t grasp this concept, then I’ll shrink the kalpa down a bit for you to enable you to understand. Let’s discuss the lifespan of a person. A person’s lifespan extends for several decades, and those years span the time of being born, the time of growing old, the time of sickness, and the time of death. Those four different periods of time are synonymous with the coming into being, stasis decay, and emptiness of a world system. Then you say, “Well, I still don’t understand—I still can’t comprehend this idea.” Well, we’ll shrink it some more and talk about a single year’s time. A year has four seasons: spring, summer, fall, and winter. Spring is the period of coming into being; summer is the period of stasis; fall is the period of decay; and winter is the period of emptiness. Do you see? In the springtime we prepare the fields for planting. The fields are planted with the intention that the plants will come into being. Seeds are planted in the earth, and the sumemrtime, after the seeds have sprouted and the plants are flourishing, is the period of stasis. In the fall the plants reach maturity, and their harvest takes place in autumn, just as the period of decay sets in. Then, with the coming of winter, after everything that grew from the earth has been harvested, there is a period of emptiness. The principle applies in the same way. When you listen to the Buddhadharma, you don’t need to be so attached, saying that you don’t understand. If you can understand the small, then you will understand the great. If you know the few, then you will be able to know the many. If you can understand what is near, then you will be able to understand what is far away. If you can listen to the Sutras without having any false thinking, then you will remember very clearly what has been spoken. But if you have a lot of false thinking while you listen to the Sutra lectures, then you will not remember clearly. And this same principle applies to every single thing you do. At that time, all those Buddhas appeared in the world—Thus Come Ones as many as the motes of dust that make up ten Mount Sumerus. The first of those Buddhas was called ‘Sumeru Supreme Cloud of a Mountain of Merit and Virtue.’ Disciples of the Buddha, you should know that one hundred years before that Buddha—Sumeru Supreme Cloud of a Mountain of Merit and Virtue—was about to appear in the world, that great forest Wheels of Blossoming, mani branches was everywhere adorned and purified”. It was different from the way it usually was—it became pervasively pure and adorned. “That is to say, inconceivable flaming jeweled clouds came forth which emitted sounds praising the Buddhas’ merit and virtue and proclaiming their numberless tongues. And the clouds emitted light, forming nets which extended over the ten directions. The palaces and pavilions mutually illuminated one another. Bright lights from jeweled flowers ascended and gathered together to form clouds, which further emitted more wondrous sounds proclaiming the vast and great good roots cultivated by all living beings in days gone by, proclaiming the names of all the Buddhas of the three periods of time, proclaiming the conduct and vows which all Bodhisattvas practice as they cultivate the ultimate Way, and proclaiming the various words spoken by the Thus Come One as they turn the wonderful Dharma wheel. “In that way, there manifested all such marks of adornment, auguring the Buddha’s imminent appearance in the world. “That is to say,” says Universal Worthy, “Inconceivable Flaming Jeweled Clouds came forth.” Among the many different kinds of adornments which were universally purified, there also appeared inconceivable flaming jeweled clouds, “Which emitted wonderful Dharma sounds praising the Buddhas’ merit and virtue and also proclaiming those Buddhas’ numberless tongues. The clouds also emitted a light which vastly radiated forming nets, and the appearance of those wonderful adornment extended over the ten directions. All the palaces thereby mutually illuminated one another.” The light from one palace or pavilion shone upon the others until they were all mutually illuminated. The sounds revealed how such and such a living being, in a previous life, planted good roots and was now reaping the good retribution as a result. The sounds proclaimed all the different kinds of causes and effects. And the sounds were proclaiming all the names of all the Buddhas throughout the ten directions and the three periods of time and praising them. And also from the clouds there came forth sounds proclaiming all the conduct and vows which all Bodhisattvas practice as they cultivate the ultimate way,” identifying, proclaiming, and praising all the Bdhisattva conduct—perhaps uttering the name of Universal Worthy Bodhisattva, or that of Manjurshri Bodhisattva, whicle proclaiming the Dharma which each of them practiced; or, perhaps proclaiming the Dharmas practiced by Gwan Shr Yin Bodhisattva or Earth Store Boduisattva. The clouds spoke of all those Dharma which all Bodhisattvas who are on the Unsurpassed Path cultivate. ‘And the clouds were also proclaiming all the various words and languages which were spoken by all the Buddha, The Thus Come Ones, as they turn the wonderful Dharma wheel. “In that way, there manifested the many previously mentioned marks and characteristics of adornment, at that time auguring the Buddha’s imminent appearance in the world.” ‘Auguring” means revealing—very clearly indicating—that the Thus Come One was about to appear in the world. “When the kings of that world saw those omens, their good roots became mature. All of them, wishing to see the Buddha, came to the Way-place. “At that time, the Buddha Sumeru Supreme Cloud of a Mountain of Merit and Virtue suddenly emerged from within his Way-place inside the great jeweled lotus and appeared. “When all the kings of that world saw those omens, their good roots became mature.” Because all the different monarchs saw those various, most auspicious portents, their good roots ripened. The good roots which they had planted in former lives have now become mature, and “ all of them, wishing to see the Buddha, came to the way-place.” Because their good roots had reached maturity, they all wanted to go to the Bodhimanda to meet the Buddha, and so they went there, to the field of the way. That Buddha’s appearance took place at the end of the century previously mentioned, which was the period of preparation. It’s analogous to when we first place flowers, incense, lamps, candles, and so forth, before the Buddha in preparation for a holiday. “His universally-pervasive body merged with the true Dharma realm as he manifested taking birth in all the Buddhalands. All the other way places appeared within his way-place. His boundless, wondrous form was impeccably pure, and nothing in the world could obscure its brilliance. It was replete with a multitude of precious marks. Each one of them distinct and clear. His image appeared in every palace so that all living beings were able to see him before their own eyes. From his body emanated limitless transformation Buddhas and varicolored lights which completely filled the world. “His universally-pervasive body merged with the true dharma realm.” All throughout the Dharma Realm, there was not a single place where his Dharma-body failed to appear. Right before this passage it says that he suddenly appeared inside the great jeweled lotus. Remember that his Way-place was situated inside the Great Lotus. That lotus was hundreds of kotis of yojanas in circcumference, and when the Buddha manifested there, the lotus and the Buddha together filled all of empty space and the Dharma Realm. “All the other way-places appeared within his way-place.” All the Way-places of the other Buddhas shone upon this Buddha’s Way-place. The Way-place of one was within the Way-place of another, and the Way-place of that other Buddha was within the Way-place of the first one, and so on until they were mutually contained. You could also explain this by saying that the Buddhas of the Ten Directions came to this Way-place, and this Buddha’s light also reached the other Buddhas’ Way-places. “His boundless, wondrous form was impeccably pure. His wonderful form body—his physical body—was boundless, limitless, and perfectly clear and pure, and nothing in the world could obscure its brilliance.” Among all worlds, none was more clear and pure than this one; and none could outshine its clear pure light in any way. “It, his form body, was replete with a multitude of all kinds of precious marks, and not only that, each one of those marks was distinct and clear. 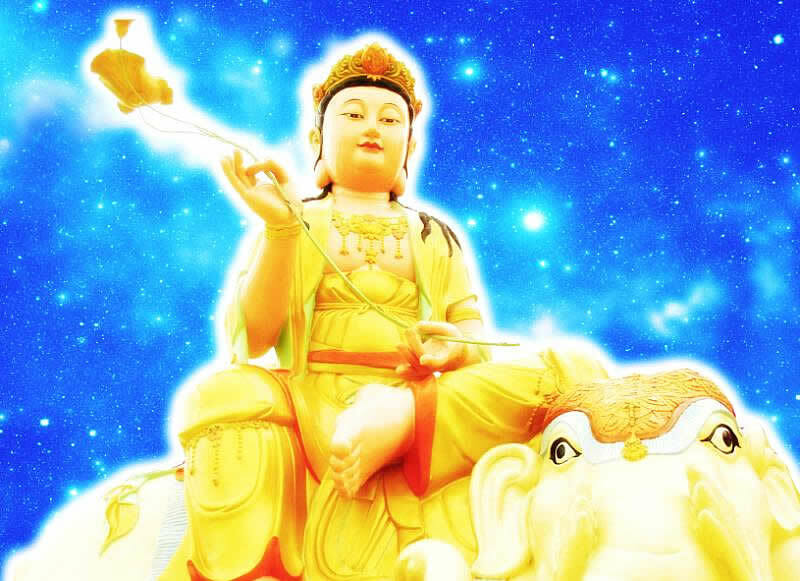 His image, the Buddha’s Dharma body, appeared in every palace, so that all living beings were able to see this Buddha before their very own eyes. “Just as the Buddha manifested a body and sat upon a throne within the great forest Wheels of Blossoming Mani Branches, on the summit of Mount Sumeru Banner of Universal Adornments of Blazing Flowers, in the sea of fragrant waters of Pure Light, so, too, the Buddha appeared in a body and sat upon a throne on each one of the sixty-eight thousand kotis of Sumeru mountain peaks of the world Supreme Sound. “Just as the Buddha manifested a body and sat upon a throne within the great forest called wheels of blossoming mani branches, on the summit of mount sumeru banner of blazing flowers, in the sea of fragrant waters of pure light in this world, not only did a single Buddha appear, but Buddha from the ten directions also manifested, each one sitting down upon his respective throne. Therefore the text reads, “ So, too, the Buddha appeared in a body and sat upon a throne on each one of the sixty-eight thousand kotis of sumeru mountain peaks of the world supreme sound. A Buddha sat on his throne inside his Bodhimanda upon each one of those many Mount Sumeru Summits, proclaiming the Dharma.